Thanks to the automated reporting function, Envira allows to create reports with the intuitive interface, in a variety of reporting perspectives, in seconds. The applied reporting methodologies improve reporting for the in-house orders. Envira significantly facilitates compliance with legal requirements related to the management of waste streams, providing the ability to store current and historical data, regulating the rights control system, eliminating the possibility of errors and ensuring the ease and transparency of processes. Thanks to the three-layer architecture and modern methodologies of software development, Envira enables quick elimination of possible defects and ensures operation of the plant without downtime. Envira presents the waste streams in the real time and facilitates the management of their statuses, increasing the efficiency of manufacturing and sales processes. The applied technologies allow to manage even the remote enterprise facilities. The ease of adapting Envira to any size of the data set, any number of operations and users, the ability to integrate the system with other systems in the plant and work in an open-source environment, ensure the digital transformation of the enterprise in the most economic way. Envira enables the detailed monitoring of processes and documents related to the waste streams, and thus to eliminate irregularities and risks of errors. In return, the system ensures data consistency, process transparency and reliability of operations. Envira facilitates modern solutions, i.e. a mobile applications, multimedia documentation, sharing data with business and community partners, building individual contractors' price lists - and all of this with by popular internet browsers. The solutions applied by Envira improve waste stream management and help waste companies to act in accordance with the principles of environmental protection. 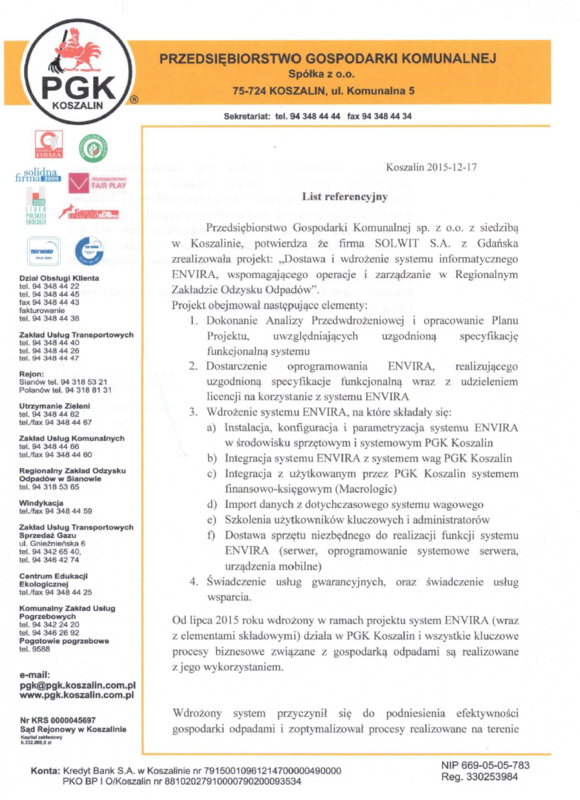 ENVIRA PSZOK, ENVIRA RIPOK as well as all our services, internal procedures and documentation, meet the GPRD requirements. Solwit.eko qualified for the technical dialogue of the Ministry of Environment. Time-consuming and laborious? Not necessarily! ENVIRA works for you, while you are on vacation! The REPORT GENERATOR - the tool that our clients like and value the most. I agree to receive the newsletter and commercial information from Solwit.eko. Consent is voluntary. I have the right to withdraw my consent at any time by sending an email to the address: [email protected], which does not affect the lawfulness of the processing, which was made on the basis of the consent expressed before its withdrawal. The data administrator is Solwit.eko based in Gdańsk. I confirm that I have read the information regarding the processing of personal data by Solwit.eko.